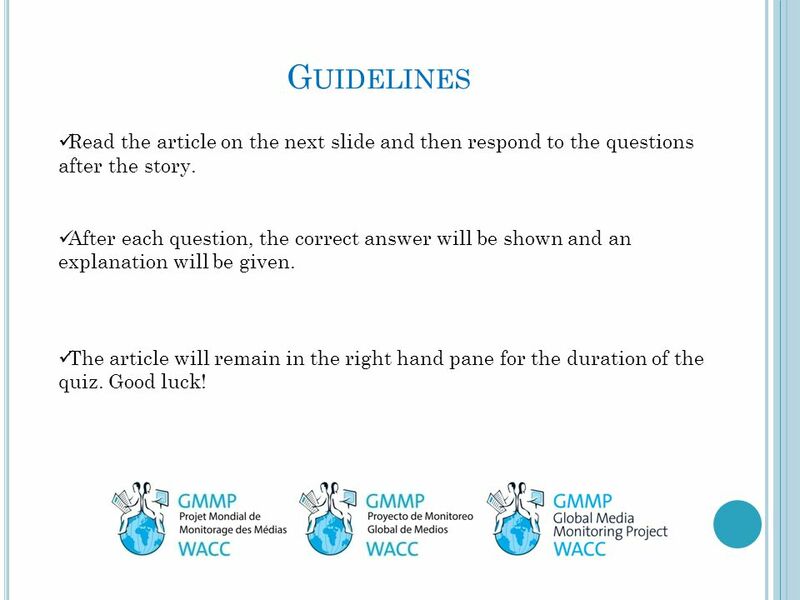 GMMP 2015 T RAINING MODULE A guide to the newspaper monitoring materials Section 1: The story. 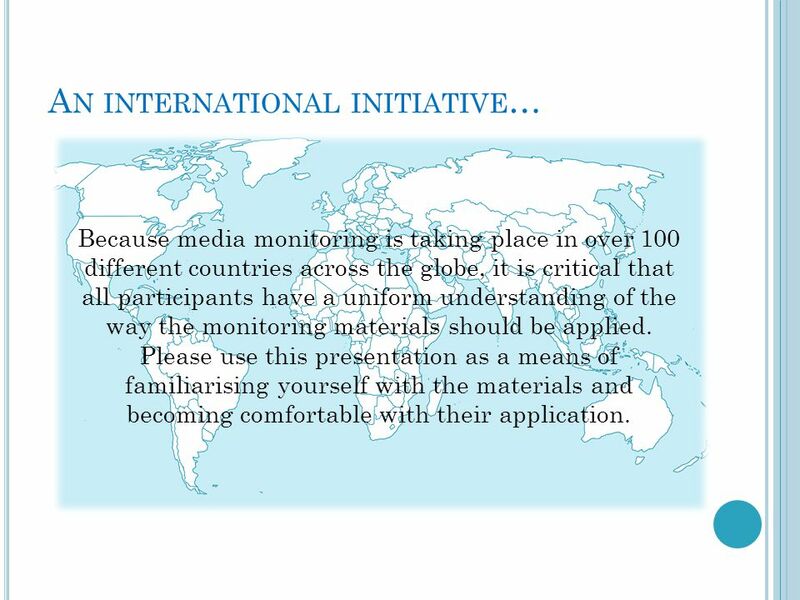 2 A N INTERNATIONAL INITIATIVE … Because media monitoring is taking place in over 100 different countries across the globe, it is critical that all participants have a uniform understanding of the way the monitoring materials should be applied. Please use this presentation as a means of familiarising yourself with the materials and becoming comfortable with their application. 4 G UIDELINES Read the article on the next slide and then respond to the questions after the story. After each question, the correct answer will be shown and an explanation will be given. 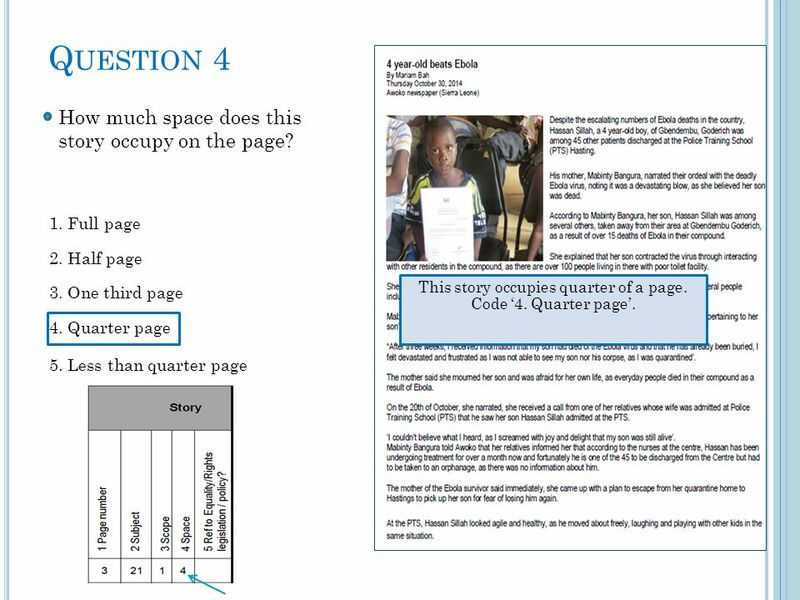 The article will remain in the right hand pane for the duration of the quiz. Good luck! 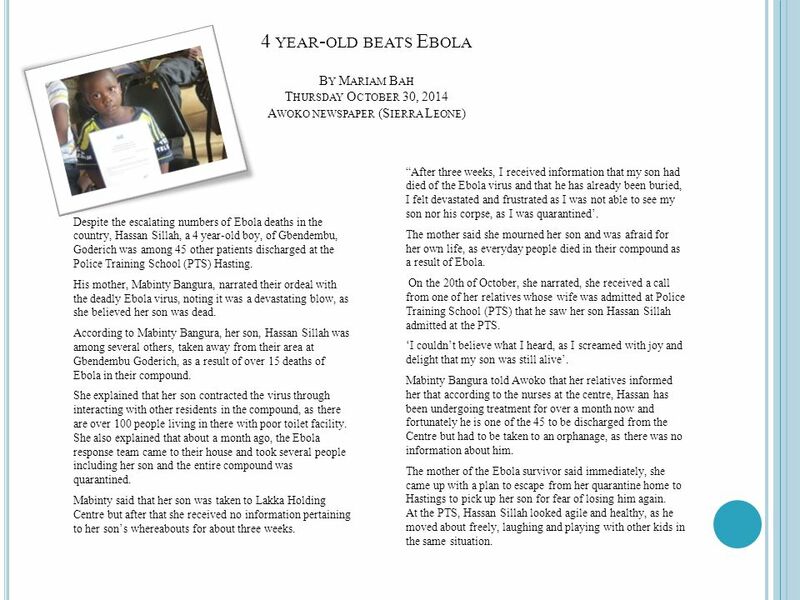 5 4 YEAR - OLD BEATS E BOLA B Y M ARIAM B AH T HURSDAY O CTOBER 30, 2014 A WOKO NEWSPAPER (S IERRA L EONE ) Despite the escalating numbers of Ebola deaths in the country, Hassan Sillah, a 4 year-old boy, of Gbendembu, Goderich was among 45 other patients discharged at the Police Training School (PTS) Hasting. His mother, Mabinty Bangura, narrated their ordeal with the deadly Ebola virus, noting it was a devastating blow, as she believed her son was dead. According to Mabinty Bangura, her son, Hassan Sillah was among several others, taken away from their area at Gbendembu Goderich, as a result of over 15 deaths of Ebola in their compound. She explained that her son contracted the virus through interacting with other residents in the compound, as there are over 100 people living in there with poor toilet facility. She also explained that about a month ago, the Ebola response team came to their house and took several people including her son and the entire compound was quarantined. Mabinty said that her son was taken to Lakka Holding Centre but after that she received no information pertaining to her son’s whereabouts for about three weeks. “After three weeks, I received information that my son had died of the Ebola virus and that he has already been buried, I felt devastated and frustrated as I was not able to see my son nor his corpse, as I was quarantined’. The mother said she mourned her son and was afraid for her own life, as everyday people died in their compound as a result of Ebola. On the 20th of October, she narrated, she received a call from one of her relatives whose wife was admitted at Police Training School (PTS) that he saw her son Hassan Sillah admitted at the PTS. ‘I couldn’t believe what I heard, as I screamed with joy and delight that my son was still alive’. Mabinty Bangura told Awoko that her relatives informed her that according to the nurses at the centre, Hassan has been undergoing treatment for over a month now and fortunately he is one of the 45 to be discharged from the Centre but had to be taken to an orphanage, as there was no information about him. The mother of the Ebola survivor said immediately, she came up with a plan to escape from her quarantine home to Hastings to pick up her son for fear of losing him again. At the PTS, Hassan Sillah looked agile and healthy, as he moved about freely, laughing and playing with other kids in the same situation. 7 Q UESTION 1 Page number. 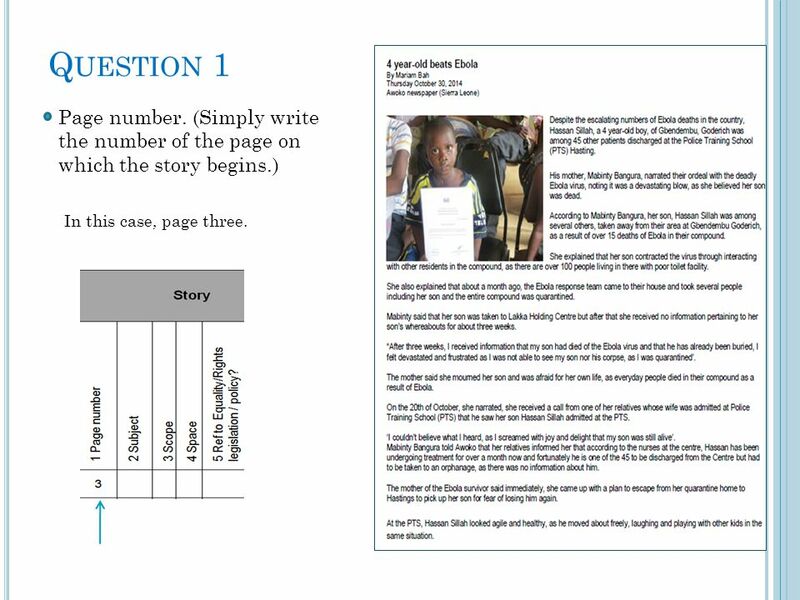 (Simply write the number of the page on which the story begins.) In this case, page three. 8 Q UESTION 2 What is the subject of this story? 21. EBOLA, treatment, response 29. Family relations, inter- generational conflict, parents 19. Science, technology, research, discoveries When there is more than one answer that seems like it might fit, choose the best of the two. 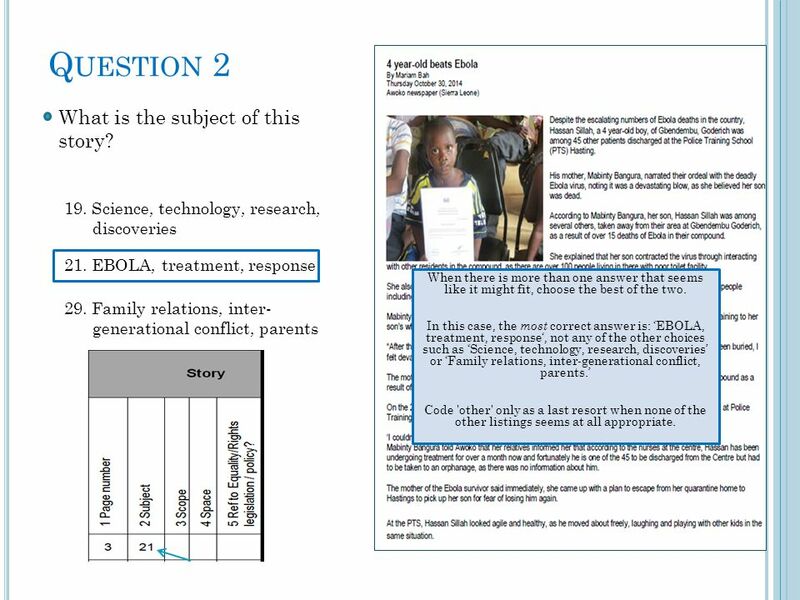 In this case, the most correct answer is: ‘EBOLA, treatment, response‘, not any of the other choices such as ‘Science, technology, research, discoveries’ or ‘Family relations, inter-generational conflict, parents.’ Code 'other' only as a last resort when none of the other listings seems at all appropriate. 9 Q UESTION 3 What is the scope of this story, assuming you are coding in Sierra Leone? (The story was published in a newspaper from Sierra Leone and takes place in the same country.) 1. Local 2. National 3. Sub-Regional and Regional 4. Foreign/International This is a local news story in a Sierra Leonean newspaper about an event in Sierra Leone. 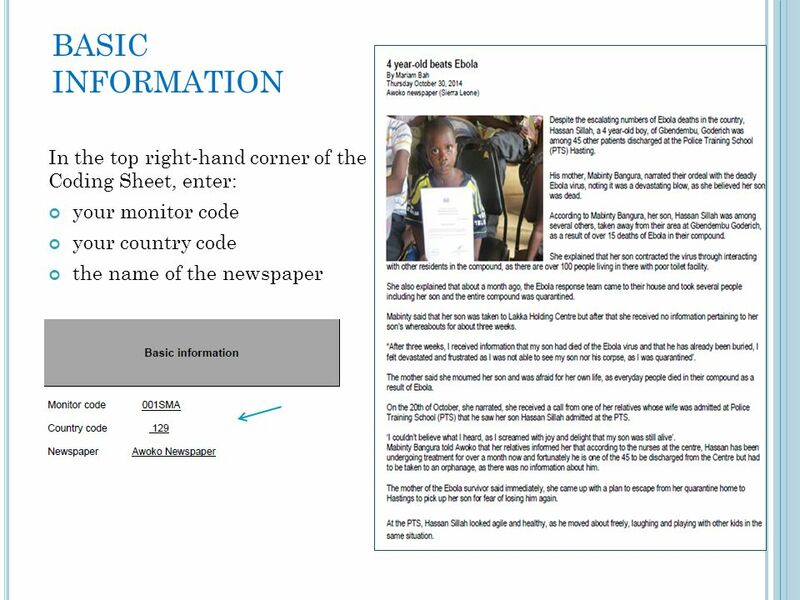 The monitoring is taking place in Sierra Leone and coders would then select ‘1. Local’. 10 Q UESTION 4 How much space does this story occupy on the page? 1. Full page 2. Half page 3. One third page 4. Quarter page 5. Less than quarter page This story occupies quarter of a page. Code ‘4. Quarter page’. 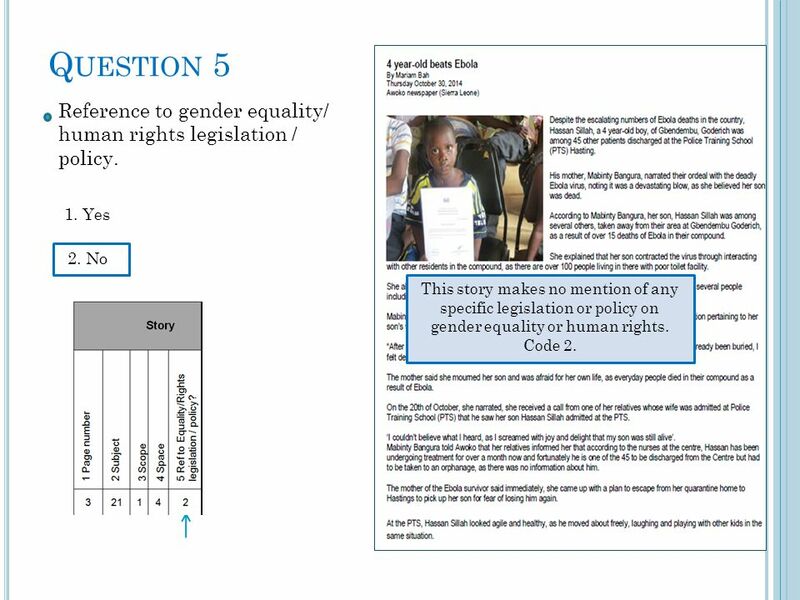 11 Q UESTION 5 Reference to gender equality/ human rights legislation / policy. 1. Yes 2. No This story makes no mention of any specific legislation or policy on gender equality or human rights. Code 2. 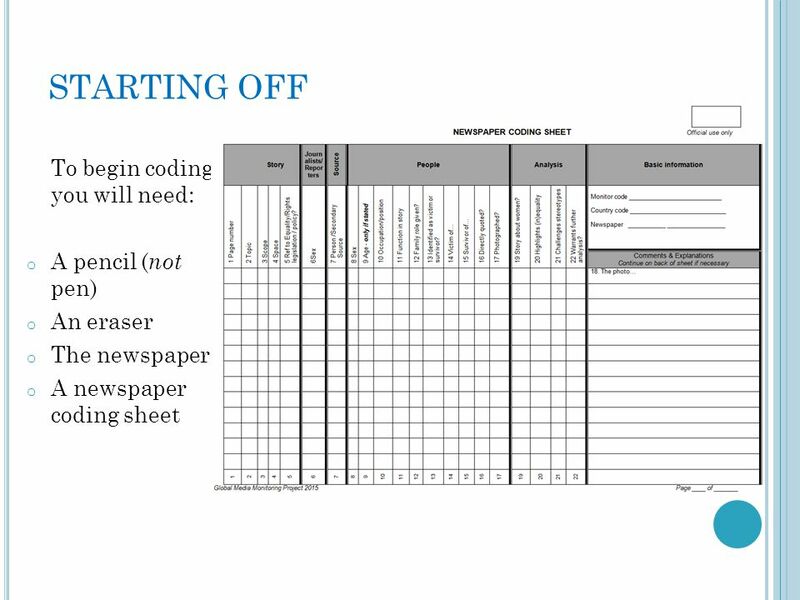 Download ppt "GMMP 2015 T RAINING MODULE A guide to the newspaper monitoring materials Section 1: The story." BME & Discipline Scenarios. SCENARIO ONE Anna is 5. You are aware that her mother is of Nigerian origin. Annas mother does not talk to you or any parents. Exodus 20:1-21 (NLT) Ten Commandments for the Covenant Community Then God gave the people all these instructions: 2 “I am the L ORD your God, who rescued. GMMP 2015 T RAINING MODULE A guide to the television monitoring materials Section 1: The story. GMMP 2009/2010 T RAINING MODULE A guide to the radio monitoring materials Section 2: Reporters and People in the News. Journey “Raising of Lazarus”. John 11: Now a man named Lazarus was sick. He was from Bethany, the village of Mary and her sister Martha. 2 (This. 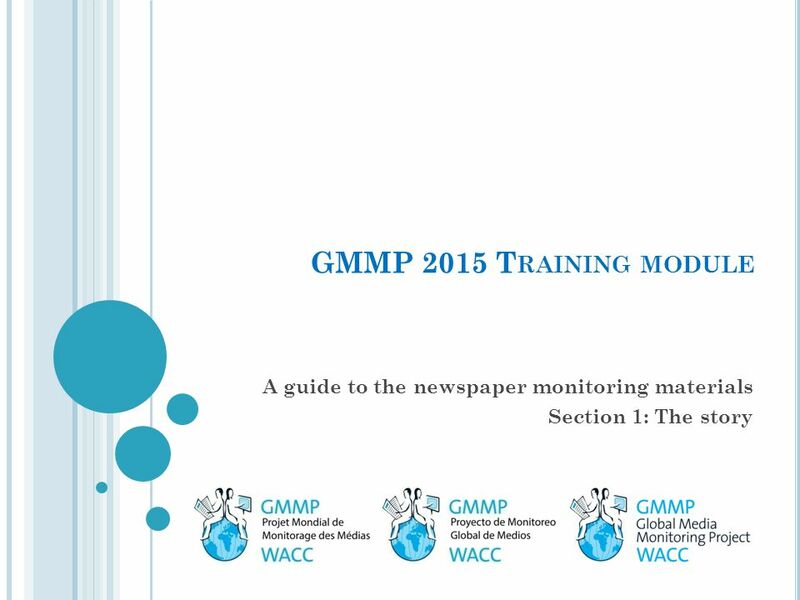 GMMP 2015 T RAINING MODULE A guide to the radio monitoring materials Section 2: Reporters and People in the News. GMMP 2015 T RAINING MODULE A guide to the television monitoring methodology Section 2: Reporters and People in the News. Believe A Little More Mark 5: When Jesus had again crossed over by boat to the other side of the lake, a large crowd gathered around him while he. Then John's disciples came and asked him, "How is it that we and the Pharisees fast, but your disciples do not fast?" Jesus answered, "How can the guests.